The Dajae Coleman Achievement Award recognizes two African American (male or female) Evanston Township High School freshman students for their leadership capabilities and ability to honor the values articulated by Dajae’s life and ethics. Winners of the Award receive $1000 scholarships to be applied toward their post-secondary education. We are now accepting applications for the 2017 Dajae Coleman Achievement Award. The deadline to submit an application is Friday, April 14, 2017. Get hands on at Chiaravalle’s 2nd Annual Exploratorium to learn how Montessori education supports creative, innovative thinkers. Accepting applications for 2017-18 school year now! Connect with Superintendent Paul Goren over coffee and conversation as part of District 65’s Community Café series for the 2016-2017 school year! There is no set agenda or presentations – simply an opportunity to talk about what’s happening in District 65 and in the Evanston/Skokie community. All cafés will take place from 9-10am. No need to RSVP. Spanish interpretation will be provided. Caring Outreach by Parents in Evanston: COPE will distribute free school supplies Aug. 12 & 13. There is a limited supply but COPE hopes to serve 1000 students this year! 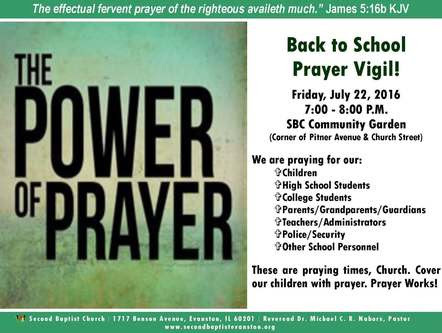 The Second Baptist Church of Evanston will host their our annual community wide, Back-to-School Prayer Vigil. It will be held Friday, July 22 from 7 p.m. to 8:30 p.m. at the Second Baptist Church Community Garden on the corner of Church and Pitner Streets. This year’s vigil will include a special litany written by Evanston Township High School students and prayers for children, parents/guardians, youth, teachers, administrators, college students and other personnel. Also included in this year’s vigil will be the music ministry of Second Baptist Church and a guest choir. C.O.P.E. (Caring Outreach by Parents in Evanston) still needs to raise about $4,500 for the school supply drive. Please help! Center for Talent Development’s annual summer conference features stimulating workshops and presentations designed to help gifted students and their parents plan for the future. Adults enjoy a keynote address and sessions led by experts in gifted education. Students in grades 4 through 12 attend workshops that provide new perspectives on current areas of study as well as future career opportunities.Children age 4 through grade 3 are invited to participate in fun supervised learning activities led by Center for Talent Development’s Summer Program staff. May 11th 7:00-9:00 pm at 1940 Sherman, Suite A. in Evanston. May 18th 11:30-1:00 at 1940 Sherman Ave. Suite A in Evanston. Let us know you are coming by calling (847) 556-8676 or email at mail@evanstoncase.org. Drop-in’s are welcome. Each summer we invite community leaders and volunteers to join us during our summer learning programs as Reading Buddies on Thursday mornings. Reading Buddy visits are among the favorite experience of our summer learners and as our programs continue to grow, we need to recruit more Reading Buddies than ever before! At this time we still have over 70 Reading Buddy openings for summer 2016! I’m writing to ask your help inviting volunteers who can contribute to the Summer Learning Program – Y Readers and Power Scholars – experiences! Can you please forward this link, which includes reading buddy details, to colleagues, friends, and community leaders who would enjoy sharing in our work? This summer, our Reading Buddies will join us from 10:30-11:30am June 16 -July 21.